• The Romanian economy accelerated in H1 2017, reporting a 5.8% GDP growth, the highest among EU countries. 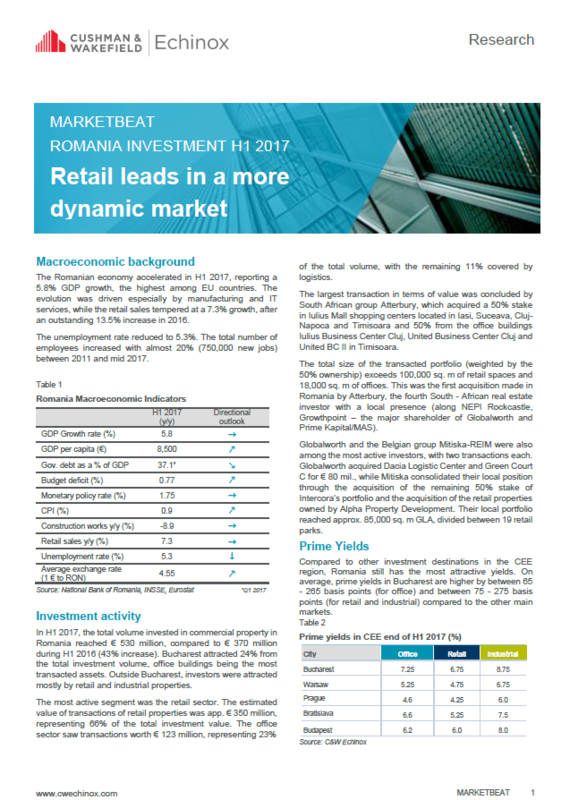 • In H1 2017, the total volume invested in commercial property in Romania reached € 530 million, compared to € 370 million during H1 2016. • The estimated value of transactions of retail properties was approximately € 350 million, representing 66% of the total investment value. The office sector saw transactions worth € 123 million, representing 23%, of the total volume, with the remaining 11% covered by logistics. • Compared to other investment destinations in the CEE region, Romania still has the most attractive yields.